My father, John “Jack” Bruce, a man many of you knew well as an artist and friend, passed in the early morning hours of Feb. 12, 2018. 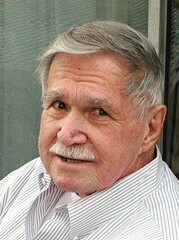 He was born in Los Angeles on April 8, 1931 to Merle and Katherine Bruce. His brother, Robert (Bud) Bruce, preceded him in death, but his sister Catherine is still living in Arizona. Dad attended Garfield High School in East Los Angeles where he played in the school band and impressed his fellow students with his artistic talent, becoming the yearbook artist. There he met my mother, Delores (Dee) Moore. Mom and dad married after high school (they were married for 17 years) and dad joined the Army as a trumpet player for the Army Band. But dad didn’t like the spit shine discipline of the band, so he put in for a transfer to the Military Police. The Army promptly sent him to the Korean War. Dad won the Bronze Star with two oak leaf clusters. When Dad was honorably discharged, he went to school for both art and psychology. He worked for a time for North American Rockwell doing artwork and drafting; he also worked in the early 60s for advertising agencies. Eventually he quit the work a day world and became a freelance artist. Dad became famous for his detailed, colorful and striking paintings of Native Americans and cowboys, winning the American Cowboy and Indian Artists award for Artist of the Year in 1984. He won many other awards, was several times featured on the cover of Southwestern Art, and even earned an honorable mention in the prestigious Butler Art Show out of New York. Some of his lithographs are in the Smithsonian in Washington. In the mid-1980s, dad moved to Mariposa and lived the rest of his life on his five acres up in the hills, with his beloved pond in the backyard. He was well known in Mariposa, both as an artist and a teacher. He had many friends in the area and donated many pieces of art for local organizations. Due to an unfortunate accident at the VA Hospital in the mid- 2000s, dad’s right arm was damaged. He could no longer paint, ending a decades-long career. Dad is survived by his children, Lorrie Erstad, who lives with her husband David Lerner in New York; Glenn Bruce, who retired from CalTrans this year and lives with his wife Shelly in Rancho Cucamonga; myself, Mark Bruce, an attorney working in Placer County as a public defender living in Sacramento; and my sister, Leslie Reining, who took care of dad in his last year on the planet. Dad also leaves five grandchildren: Glenn’s kids are Stephanie and Jeff; Leslie’s children are Elizabeth and Joshua; and my son is Adam. We are going to inter dad at the Dixon Cemetery with other veterans so they can all tell each other war stories for eternity. I appreciate your father’s service to our country! He will be missed. I am deeply saddened and surprised at the passing of your father. He was my dad’s oldest and dearest friend and we spoke on the phone a few times each year since my dads passing. Most of my memories of my own father include “Jack” since the two of them were quite the pair in their younger days. I had not spoken to him since January and when calling him today was surprised to find the number was no longer in service. I am so sorry for your loss. He will be missed.